Tired of going to the beaches in Boracay, Puerto Galera, and Palawan this summer? Then why don’t you try going to Gota Beach in Caramoan, Camarines Sur instead? Part of the 347-hectare Caramoan National Park, Gota Beach is composed of two coves, the Small Gota Beach (the southern cove in the article thumbnail), to which the road from the town connects, and the Large Gota Beach to the north, which serves as a jumping point for island-hopping. Unfortunately, you can’t go this beach right this very moment. Why? Because, according to rumors (Inquirer article), the French edition of Survivor, Koh-Lanta, is currently filming in Gota Beach and a billboard saying that the beach is closed due to “massive developments” was put up on the road leading to the beach. A gag order was imposed on the whole town though leaks have been coming out. Filming will supposedly end today and the beach will be reopened in June. Here’s an article from the Caramoan Residents Association for more juicy details. Photo of the Large Gota Beach by Ferdz Decena. If you want to learn more about the sights at Gota Beach and the nearby islands, here’s a great blog post from Ferdz Decena, a blogger-acquaintance of mine (the photo above is his). This photo gallery hosted at the Ateneo de Naga University website, is also chock-full of pictures. 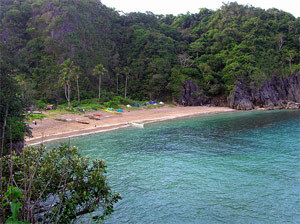 Well, Gota Beach, surrounded by massive vegetation-covered limestone cliffs, is quite a picturesque sight. Thanks to Filipinayzd for suggesting this sight to me. is there a hotel, villa, cottage or any infrastructure for lodging in Gota Beach? any no.? or email add of Gota Beach Resort for informations? i just want to request contracted rates. hey guys. me and wifey planning to go this 21 – 23 Aug 09. we are looking for company. i would like to go to gota beach : either beach resort or gota village, but I can’t reach any of them. Do you have contact numbers ? hi.. I got the link to their website. where can i get a brochure of gota beach?? ?